Kind of a weird one. Some very obvious omissions and some weird games included. 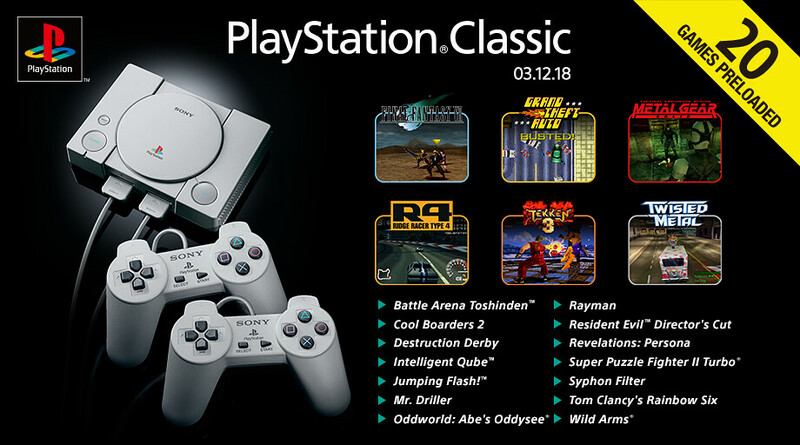 Because when you think classic PSX games, who thinks of Rainbow Six? some of the games I could think of that are missing probably have licensing issues, like Gran Turismo, Jet Moto, and Tony Hawk. And then something like Ape Escape requires the Dual Shock when this system just has the standard PSx controllers. Also weird they did Tekken 3 because it was the best on the system, but then put the original Twisted Metal when I'm pretty sure everyone really remembers 2. XI is known as Devil Dice here. Lucky them, that game was cool. Would have been neat to see a Densha de GO in there but oh well. I think I already own all the games from either of those lists that I'd want to actually play, though at this point I think I'd have to emulate them. I'm not sure I have a working system for PS1 games anymore.